Place the sea bass in the stockpot with the onion mixture, allow it to cook for 5 minutes, and add the remaining water. When the fish mixture comes to a boil, cover the pot, lower the heat, and add the vegetables in the order given, finishing off with the pricked habanero chile, which you will remove (and reserve) when the thiebou dienn is spicy enough for you. Cook for 20 minutes. Remove the sea bass steaks keeping them whole, and place them on a serving platter. Cover them with a bit of the cooking liquid, and keep them warm. Continue cooking the thiebou dienn for an additional 15 minutes, then remove the vegetables and arrange them on a platter and keep them warm. Reserve 2 cups of the cooking liquid to make the sauces. Return the remaining liquid to a boil, add the rice, cover, and cook for 20 minutes, or until the liquid is absorbed and the rice is done. While the rice is cooking, pulverize the habanero chile that you have reserved and add it to 1 cup of the reserved cooking liquid. Heat it, stirring occasionally, and place it in a sauceboat. Heat the remaining cup of reserved cooking liquid and place it in a separate sauceboat. This will give you a regular sauce and a fiery-hot one. When ready to serve, mound the rice on one platter and the fish and vegetables on another. Alternatively, you can place the rice in a large basin or deep dish and arrange the vegetables and fish on top and eat Senegalese-style with your hands (right hand only, please!) or with a large spoon. As one of six children in a Puerto Rican household, Lillian Aviles Fisichello (yes, she's the author's grandmother) watched her mother make her fair share of inexpensive but delicious meals. 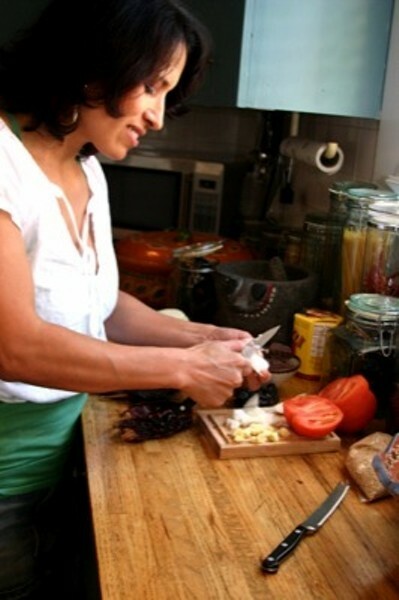 "There was always so many of us coming and going so my mother would make Picadillo all the time because she could make big portions for the family easily without spending too much," she says. "When I became a mother I made it for my family once a week. It has always been a family favorite." Sautee chopped green pepper, onion, garlic, cilantro and ahi peppers in olive oil. Add one can tomato sauce and a can of water. Add the two packets of sazon followed by the goya alcaparrado, oregano, salt and pepper. Let simmer for 20 minutes then add chopped beef. Cook for hour and a half and serve over pasta or rice. Sun Lee is only 23 years old, but having a working mom and two older brothers to feed forced her to learn her way around the kitchen early on. Thanksgiving dinner has been her responsibility since she was a teenager, and every year her table is decorated to the max with American and Korean food, including the popular dish bulgogi. "It is a very simple traditional dish that only requires a little amount of effort," says Lee, "but it yields a wonderful and unforgettable taste that will have you craving for it over and over again." In bowl: Mix soy sauce, coke/sprite, sugar, minced garlic, crushed kiwi, and black pepper. (Mix until the sugar has dissolved.) *You may add more or less soy sauce and sugar to your preference. Place meat into sauce mixture and mix with hands. After meat and mixture are incorporated add Sesame Seed Oil and mix again. Let sit for at least 2 hours (usually over night), then cook over hot flame in skillet. While cooking you may add sliced onions for flavor. After 3-5 mins of cooking, plate meat and sprinkle Sesame seed over top for garnish. (You may also use sliced green onions for garnish as well.) Serve with/over rice.